This plant is the result of everything I learned since I signed up on Grow Diaries. Autoflowering strain, topping, cropping, LST, coco coir, automatic watering system. That was pretty fun, but also hard to do. It was hard because, as an auto, she had a pre-defined life cycle, and all that training had to be made with not enough recovering time between sessions. By the way, I got a big surprise here. Until the last defoliation I couldn’t see how many buds I got there. And I didn’t expect those buds could increase their size that much in just a week. This time I even did a proper flush and let the medium dry up before harvesting. 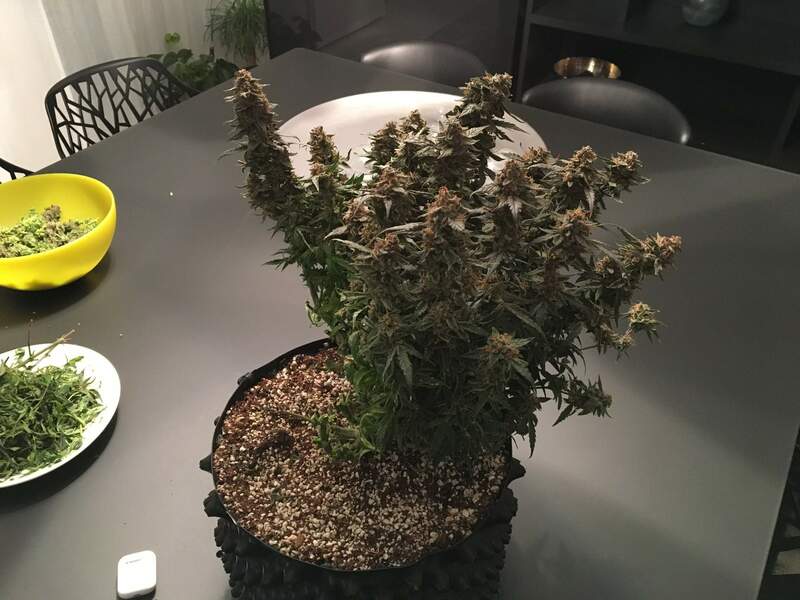 Because of the size of the plant, I had to split harvest into 3 days. But look what I got: 133.2 grams! I’m so happy about this result. I was expecting something like 70 grams, but I doubled that value! Since I tried some buds from the net, it should be even more than this, though. This strain is a new generation auto from Royal Queen Seeds. It’s not one of the old ones with 30% ruderalis like many of their other auto strains (I think they should update them decreasing ruderalis percentage), and I have to say that it’s a very strong one. Nutes resistant, or even nutes lover. Will even love hard training. I messed up with the PPM since I had no time to manage it properly, and I got a little overfeeding in the last weeks, as soon as I added Overdrive to the reservoir. What I mean is that PPM has been over 4000 for like all the cycle, following Advanced Nutrients dosage (4ml/L of Connoisseur A+B and 2ml/L of all the other additives). That’s the kind of strength I’m talking about. It was my first time managing irrigations with a reservoir and a water pump, and I think it’s been a life changing experience. It allowed me to save much time, and helped me going on vacation for 10 days with almost no worries (just some salts accumulation in the pot during those days as she started sucking a lot of water, not allowing runoff to come out anymore). That system helps you, but you still have to be there. Because coco coir is good, but it requires a proper maintenance. The Stress Killer Automatic is a mix of Lemon Haze and Juanita La Lagrimosa. She doesn’t smell like lemon, but she definitely has a sweet, candy-like taste. She reminded me of the AK47 auto from RQS I tried some years ago. Talking about the effect, I think this strain does exactly what they say about it. I mean, you smoke, wait some minutes, and start feeling light in the head. It’s a bit stronger than other CBD strains I’ve tried, and even if you can feel a bit of indica on it, Stress Killer is much more on the sativa side. It’s not so strong, so you can do whatever you wanna do, but if you vape it, just don’t go over 185C or you’ll start feeling a bit groggy. 200C is the best temperature to get everything it has to offer, but for daytime I prefer 180C or 185C. By the way it works nice to help you take life less seriously, and help positive thoughts flowing in your head. But, as always, weed is not a remedy against problems. If you’re a bit stressed, that’s ok and it works great, but if you have bigger problems, I think weed can’t do much to help you solve them. Higher THC strains will even do worse in case of bad trips. In general I’m so happy about this strain. It’s not the best one I’ve tried to do activities (Royal Highness, to me, with her clear mind experience, is definitely the best one out there), but that’s very nice to relax after work or an intense activity, or just to remove some light stresses coming from discussions or some negative thoughts/overthinking. Thank you Royal Queen Seeds, and especially @James! :raised_hands::skin-tone-2::clap::skin-tone-2: Fantastic results! Agree :100: with the conclusion comments. My pheno came more on the lemon side of things. Cheers happy growing! @CANNASIM, Cheers bud, and thank you! Sorry, I didn’t see this comment!! Excellent work, T , and congrats on your award. My fav or your diaries. The plant structure and density is nuts! @FrostyGardens, Thank you very much bud! What's your secret for getting light penetration so low? You're using LEDs right? 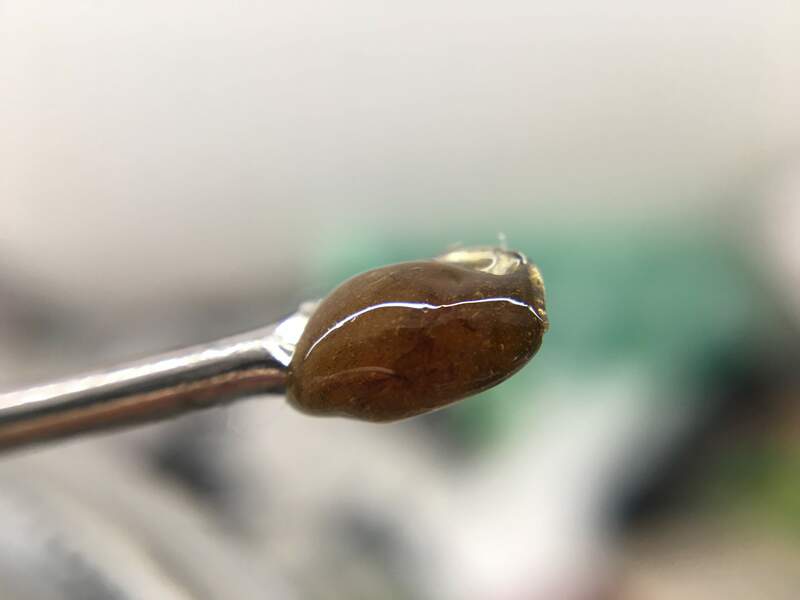 If I don't lollipop, I tend to get larfy buds at the bottom. I just recently updated my lighting to 1200w and 1500w LEDs (two separate tents), and I think I noticed a difference. a true master at work. Great looking plant, and results. Congrats! Great diary, MONSTER plant, great job. THX for sharing forum page about Advanced nutrients PPM.